This is pretty much an upscale version of mac and cheese. 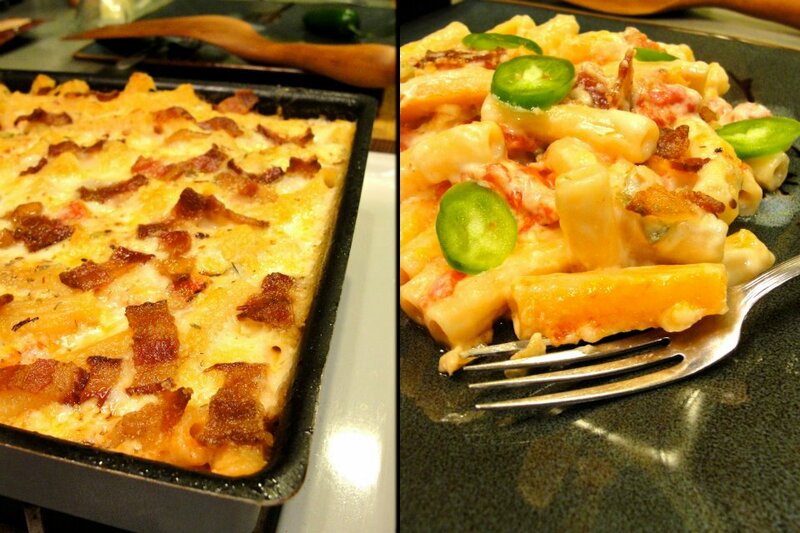 For 6-8 servings, it’s rigatoni (1 pound dry pasta), prepared al dente, mixed with chopped stewed tomato (1 can, drained), one finely diced large jalapeno (with seeds), all tossed with cream sauce, then put in a baking pan (10″ x 10″ x 2″), topped with more cream sauce, and sprinkled with red pepper flakes, dried oregano, and optionally 1/4 pound of bacon pieces (cooked in advance). Then it was baked for 30 minutes at 375°F until lightly browned. Set for perhaps 10 minutes then served topped with thinly sliced fresh jalapeno pepper.